While some people already understand the important role honeybees play in our world, many people only see them as a nuisance. Sure, everyone knows they make the honey that helps us sweeten our foods, but, beyond that, most see little use for these creatures. 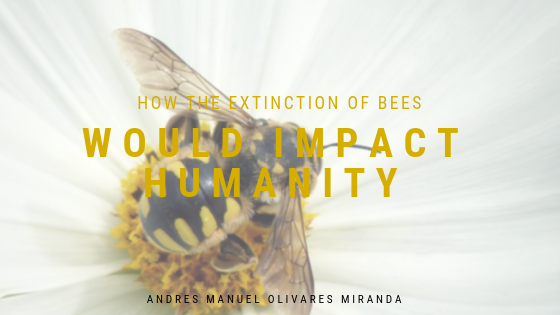 However, honeybees are more crucial to human survival than many people realize. Together with birds and bats, honeybees help to pollinate up to 90% of the natural foods we consume every day. This means many species of plants would quickly die off. As the bee pollinates a type of plant, it transfers the pollen from a male plant to a female plant via the pistils. Without the honeybee to facilitate reproduction, entire species of plants would die off. This has already started to happen in areas where air pollution, pesticide use and heavy rains chase off the honeybee population. Even plants we don’t eat would still affect our ability to survive. Once the plants start to die off, there would be no more food for herbivores, which include many types of cattle and other farm animals. Very soon, we would no longer have natural dairy products or many of the meats that we rely on for protein. Conversely, predatory animals would begin to thrive. Eagles, vultures, and ravens would begin to pick off the weakened herbivores. These animals would begin to pick off the animals we rely on for sustenance because their thinned herds would make them easy prey. In addition to impacting our food supply, the lack of honeybees would mean we couldn’t continue to produce crops to use as biofuels or for producing clothing. Further down the line, trees would begin dying out as well. In addition to losing the fresh oxygen they produce, fewer trees would mean our access to fresh water will soon be limited. We need honeybees for more than just honey. Without them, starvation and dehydration would soon spell our demise.